He he anarchy rules !!! Edited by abarbarian, 16 January 2011 - 01:33 PM. Only two days and nights? You're not done...you've got to break a few things first before you can say you're done. ;)Way to go! Awesome Abarbarian!!!! :thumbup:So how do you like E17? I have not used it in over a year. I wonder if they have good multi-monitor support in Enlightenment? E17 will be ok when I figure out and choose some new themes. I know what ya mean. 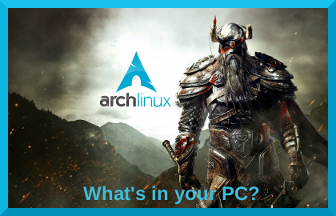 I enjoy using E17 (using it here in PCLOS) a lot more once I played around with different themes and found some that work well for me.You folks here (and at a few other Linux forums) are starting to get me interested in Arch. Sounds good, I will have a look at the articles after work later tonight. Read them a while ago and they helped me make me mind up about E17. Ok I'll fess up. I do have a little glitch to iron out. I can only log in to Slim as root. If I try to log in as ME I get " Failed to execute Log In command" Had a good look around but can not seem to see what the problem is. I checked and it looks like I have created a user ME as I have a ME folder.An ME has a password in /etc/shadow so it looks like ME is valid as a user.Any ideas folks. Edited by abarbarian, 16 January 2011 - 07:15 PM. # Path, X server and arguments (if needed)# Note: -xauth $authfile is automatically appendeddefault_path /bin:/usr/bin:/usr/local/bindefault_xserver /usr/bin/Xxserver_arguments -nolisten tcp vt07# Commands for halt, login, etc.halt_cmd /sbin/shutdown -h nowreboot_cmd /sbin/shutdown -r nowconsole_cmd /usr/bin/xterm -C -fg white -bg black +sb -T "Console login" $#suspend_cmd /usr/sbin/suspend# Full path to the xauth binaryxauth_path /usr/bin/xauth# Xauth file for serverauthfile /var/run/slim.auth# Activate numlock when slim starts. Valid values: on|off# numlock on# Hide the mouse cursor (note: does not work with some WMs).# Valid values: true|false# hidecursor false# Path, X server and arguments (if needed)# Note: -xauth $authfile is automatically appendeddefault_path /bin:/usr/bin:/usr/local/bindefault_xserver /usr/bin/Xxserver_arguments -nolisten tcp vt07# Commands for halt, login, etc.halt_cmd /sbin/shutdown -h nowreboot_cmd /sbin/shutdown -r nowconsole_cmd /usr/bin/xterm -C -fg white -bg black +sb -T "Console login" $#suspend_cmd /usr/sbin/suspend# Full path to the xauth binaryxauth_path /usr/bin/xauth# Xauth file for serverauthfile /var/run/slim.auth# Activate numlock when slim starts. Valid values: on|off# numlock on# Hide the mouse cursor (note: does not work with some WMs).# Valid values: true|false# hidecursor false# This command is executed after a succesful login.# you can place the %session and %theme variables# to handle launching of specific commands in .xinitrc# depending of chosen session and slim theme## NOTE: if your system does not have bash you need# to adjust the command according to your preferred shell,# i.e. for freebsd use:# login_cmd exec /bin/sh - ~/.xinitrc %sessionlogin_cmd exec /bin/bash -login ~/.xinitrc %session# Commands executed when starting and exiting a session.# They can be used for registering a X11 session with# sessreg. You can use the %user variable## sessionstart_cmd some command# sessionstop_cmd some command# Start in daemon mode. Valid values: yes | no# Note that this can be overriden by the command line# options "-d" and "-nodaemon"# daemon yes# Available sessions (first one is the default).# The current chosen session name is replaced in the login_cmd# above, so your login command can handle different sessions.# see the xinitrc.sample file shipped with slim sourcessessions enlightenment,xfce4,icewm,wmaker,blackbox# Executed when pressing F11 (requires imagemagick)screenshot_cmd import -window root /slim.png# welcome message. Available variables: %host, %domainwelcome_msg Welcome to %host# Session message. Prepended to the session name when pressing F1# session_msg Session:# shutdown / reboot messagesshutdown_msg The system is halting...reboot_msg The system is rebooting...# default user, leave blank or remove this line# for avoid pre-loading the username.#default_user simone# Focus the password field on start when default_user is set# Set to "yes" to enable this feature#focus_password no# Automatically login the default user (without entering# the password. Set to "yes" to enable this feature#auto_login no# current theme, use comma separated list to specify a set to# randomly choose fromcurrent_theme default# Lock filelockfile /var/lock/slim.lock# Log filelogfile /var/log/slim.logApologies fore the long copy but I did not know which bit you wanted to see. Edited by abarbarian, 17 January 2011 - 12:26 PM. Ok, looking over it now. Also, could you post your ~/.xinitrc file? Does the command startx start your environment? I am trying to see if it is a Slim configuration issue or a ~/.xinitrc issue. My actual ~/.xinitrc,#!/bin/sh## ~/.xinitrc## Executed by startx (run your window manager from here)# exec gnome-session# exec startkde# exec startxfce4# ...or the Window Manager of your choiceexec enlightenment_startStarting E17If you use startx or a simple Display Manager like XDM or SLiM, add or uncomment the following command in xinitrc:exec enlightenment_startSingle environmentsTo configure SLiM to load a particular environment, edit your ~/.xinitrc to load your desktop environment:#!/bin/sh## ~/.xinitrc## Executed by startx (run your window manager from here)#exec [session-command]SLiM reads the local ~/.xinitrc configuration and then launches the desktop according to what is in that file. If you do not have a ~/.xinitrc file, you can use the skeleton file by:$ cp /etc/skel/.xinitrc ~Looks the same as the wiki examples so I'm a tad confused.I think I have followed the Arch wiki install to the letter. An I have only pacmaned Slim,FF,E17 + E17 extras, as far as I can remember. Any changes I made and tried I went back and undid before trying anything else. A bit long winded but at this stage it is helping me learn. Ta for taking the time to help. Give me a minute to look around. OK, your ~/.xinitrc is fine. I just tried it via startx and E17 loads. So it has to do with your configuration file. Off to research more. Right! !I have never used a login manager on Arch, so I am kind of "shooting in the dark", per say. I know you followed the wiki to the "t" but they may have missed something as well. I have found numerous posts in the Arch forums and elsewhere but nothing really popped out to me while looking over your config and .xinitrc file.